Looking for a high quality personal defense round? 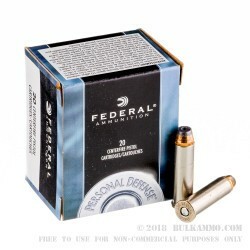 The Federal Personal Defense line of ammunition offers proven performance and reliability for your favorite revolver. 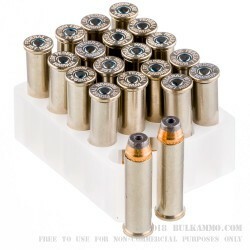 Using high-quality primers and powders from Federal, these .357 Magnum rounds are loaded with a 158-grain jacketed hollow point projectile, into boxer-primed, noncorrosive reloadable nickel plated brass cases. 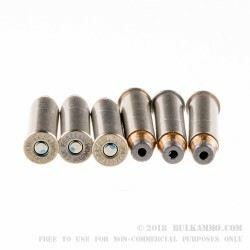 Capable of a muzzle velocity of 1240 FPS, these rounds offer excellent penetration and stopping power with a high level of expansion. 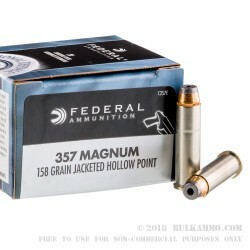 Each box comes with 20 rounds of .357 Magnum Federal 158-grain JHP ammunition. Made in Anoka, Minnesota, Federal has become one of the most trusted producers of ammunition in America. Utilizing cutting-edge techniques and manufacturing processes, they continue to be at the forefront of firearms technology.